You probably hear oyster catchers before spotting them on any given day, but starting early spring into their breeding season, these guys will get even louder and protective over their rocks. You will hear a loud, ringing whistle that is easily heard above the sounds of boats and waves. Their range extends from Alaska to Baja but these shorebirds are more abundant in the San Juan Islands than anywhere else in the Puget Trough. The Black Oystercatcher is a year round resident to the San Juan Islands, a fun bird to see sporting a chunky black body, a long red beak, distinct yellow eyes and dull pink feet. 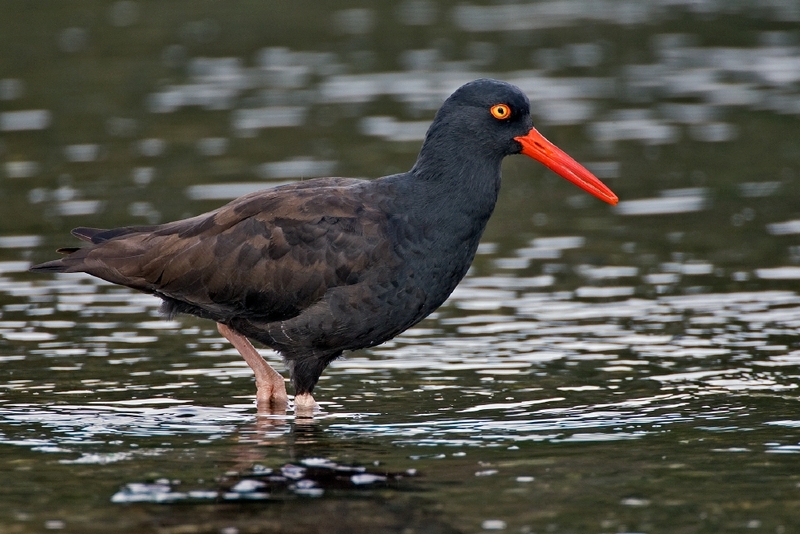 Oystercatchers inhabit rocky shorelines, offshore rocks and islets all around the islands where predators are fewer. They choose areas with abundant shellfish and other marine life as they search for mollusks such as mussels, limpets and chitons to feed on. These clown looking birds use their long and sturdy beaks, which resemble an oyster knife, to pry their prey off rocks and slice into their protective shell in order to extract the meat. Another method they are observed doing to reach their food is simply hammering on the shells to break them open. They are also known to use the rocks and crevices on the shores as a tool to hold the prey in place as they try to pry them open. During their breeding season in the spring, they separate into breeding pairs and become very territorial and NOISY! Oystercatchers may mate for life and nest building as well as incubation of eggs will be done by both parents. They are very vulnerable to disturbances at birding sites, as disturbances from boaters could allow gulls, crows, and other opportunistic birds to steal their eggs or young from the nest. The young should never be left alone in the nest; one of the parents is always babysitting as the other goes and forages for food. After hatching, the first thirty days will be an oyster catcher’s most critical period in their life where they will hopefully learn how to fly and forage for food. If successful, they might live longer than 30 years and will always remain close to their place of birth. Being my favorite bird out on the San Juan Islands, it is crazy to think that some oystercatchers commonly seen on our trips are older than I am!